Time Difference of Arrival (TDoA) scheme is based on precise measuring of time difference between signals arrival to the Anchors. In this scheme the Anchors need to be accurately synchronized, they need to run same clock. Implementing TDoA brings several advantages for location system. Tag doesn’t communicate with Anchors individually, it doesn’t know their addressing range. It leads to the significant prolonging of battery life since the Tag needs to send only one Blink message in order to be localized in space. In comparison to TWR, where 9 messages is required to be exchanged in order to localize the Tag. Therefore the battery life of Tags may be prolonged appropriately. Furthermore since there is no prior address binding between Tags and Anchors as in case of TWR system, the number of Anchors operating in system are fully scalable. Adding more Anchors into the system doesn’t require any reconfiguration of the Tags even RTLS server. Tags use only short portion of time to send Blink message, therefore high number of Tags may transmit signal within one refresh rate. RTLS based on TDoA is thus fully scalable in terms of number of Tags handled by the system. With increasing refresh rate (ms) also the number of Tags is higher. In TDoA based system the locationing process is processed according to the following scheme. The Tags transmits in regular interval (refresh rate) short Blink message. Such message is processed by all the Anchors in communication range. Regardless their synchronization status, the Anchors send all the timestamps to the RTLS Server through the Ethernet. To calculate position of the Tag, the RTLS Server considers only timestamps coming from at least three Anchors with the same clock base. The synchronization is realized wirelessly, automatically selected Anchors with the optimal coverage called Master Anchors in regular interval broadcast Sync signal. The Anchors in communication range of Master Anchor define cells where all the Anchors are running same clock base for given period of time. 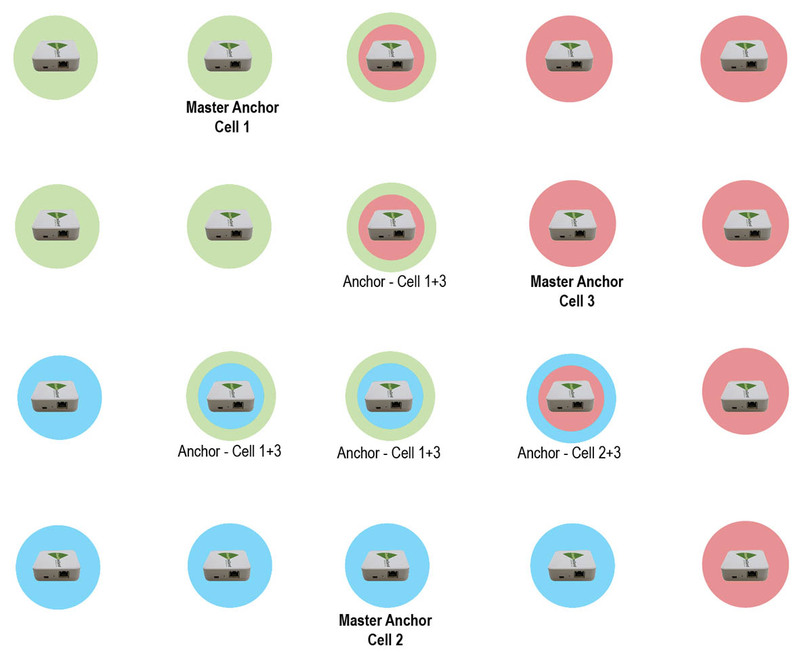 It is common that some Anchors are synchronized by more Master Anchors, as depicted below. The selection of Master Anchors is manner of comprehensive radio survey process which is conducted automatically by RTLS Manager without user intervention. In brief, the Anchors with the optimal quality parameters of UWB links and with the strategical deployment are selected as the Master Anchors. The process and results of radio survey may be managed by user to optimise the process according its expectation. Sewio RTLS platform consists of the Anchors, the Tags and RTLS server, all components connected through the IP network managed by customer. The Anchors accommodate full TCP/IP stack allowing seamless integration of Anchors into the existing IP infrastructure. The IP address of the Anchors may be provided by local DHCP server or preconfigured statically. The configuration and management may be done by accessing the web interface of given Anchors. Powering is done either using mini USB socket or through the Ethernet PoE. In latest release passive PoE is used, therefore intermediate PoE splitters need to be involved in the network. The RTLS Server in addition to Location Engine, HTTP API and Sensmap Framework offers RTLS Manager, web tool that makes the management and update of RTLS devices more easy.